Isn’t it interesting how simply reading before bedtime can induce peaceful sleep or the fact that no matter how many weekend plans you make, your preference to sleep-in overrides them all. But, we are not going to talk about those facts here. We are going to talk about scientific facts like “How it is impossible to sneeze while sleeping”. We bet you didn’t know that one! Sleep, dreams and its relation with your personality has been an area of interest for the longest time. However, as an area of research, sleep is a fairly new entrant. Here are some Sleep facts that you might want to know about. 1. Parasomnia is an actual sleep disorder, that involves abnormal behavior while sleeping. It ranges from sleep walking, sleep eating and sleep talking to more dramatic ones like committing crimes and bed wetting. 2. In the 17th century, it was common for people to have a few waking hours at night. So, basically, they slept with an interval in between. So imagine, we sleep to rest our body and mind. And here people used to take a break from resting and then rest more. And what did they do in the time that they were awake? It was used for reading, praying, socialising or intimacy. 3. Before the advent of colour television, only 15% of people dreamt in colour. The rest of the population saw dreams in black and white. Sleep experts say that these numbers have now changed. Hence the advent of colour television not only revolutionized your picture but also your dreams. 4. Research says that the moon affects our sleep pattern. We sleep better during a new moon and worse during a full moon. No one is able to point out the reason for this, but possibly there is a hint of vampire in us all. 5. “Hypnic Jerks”, that feeling when you are half asleep and you feel that you are falling down and then you jerk yourself awake. There are many who go through this. The reason could be due to high anxiety or increased physical activity close to sleep time. But, the symptom of hypnic jerks reduces as we grow older. Clearly it has nothing you do with the adventurous soul you are! 6. We forget 50% of our dream within 5 minutes of waking up! Not fair, right? 7. Tiredness peaks twice during a day at 2 a.m. and 2 p.m. That’s why we are less alert after lunch. 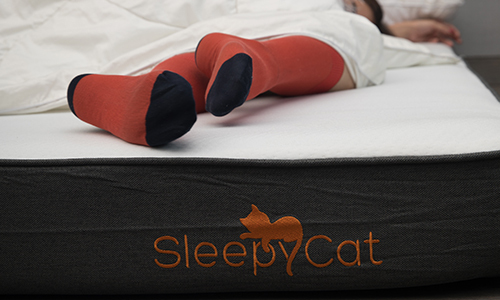 So, you have a reason to take a break from your work and snuggle into your SleepyCat mattress for a power nap to refresh yourself and keep you alert for the rest of the day! 8. Did you know there is a definite term for millennials who find it difficult to wake up on a Monday morning after their hectic weekend? It’s called “social jet lag”. Yes, the changed weekend schedule results in social jet lag. 9. There is a direct co-relation between the position that you sleep in and your personality. For instance, people who sleep straight like soldiers, are usually reserved in nature. If only it were possible to change your sleep position, everyone would be a social butterfly. 10. And lastly, guess which is the biggest sleep distractor of all? Yes! The 24-hour internet connection. While these are fun facts to read, adequate sleep is very critical for our brain and systems to function optimally. And, your mattress plays a key role in helping you get that peaceful sleep of 8 hours. So choose one wisely!